Hi Everyone! Hope your Friday is off on the RIGHT FOOT!! Get it? Foot... coz I'm sharing some Stockings... Hehehehe. OK, enough about my corny joke. These Stockings are no laughing matter. Check out 2 of our Designers who share 2 very different styles of Stockings. They were both handmade with love, for their beautiful grand daughters. 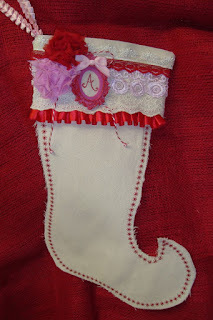 First Stocking is by Designer Cynthia Anderson. Shabby chic and bling for the baby's name. Definitely won't go unnoticed at the fire place. For more information, click here for video. of lace and how Janet made the stocking look more Elfy (wait... is that a word? ), with pointed toes. 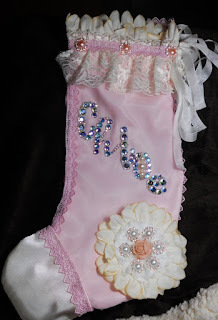 Another beautiful stocking, that will surely be noticed at the fire place. For more information, click here for her video. Send us photo's of your stocking on our facebook page! We'd love to see! !